Foundlings, book one of The Peleg Chronicles is Historical Fiction that takes place in the time period of Peleg, soon after the tower of Babel dispersion. In a land of giants and dragons, and men running from the knowledge of their Creator, wickedness spreads as a plague, but a remnant of faithful souls shine in the darkness. Homeschool subjects covered: Literature, character studies. Foundlings is another great book for your homeschool library! Foundlings, book one of The Peleg Chronicles is Historical Fiction that takes place in the time period of Peleg, soon after the tower of Babel dispersion. In its pages we meet dragons, giants, false priests, the death hunt, an under-city of the Dwarven Brotherhood, and many memorable characters. The story begins with Lord McDougal and his faithful shield-bearer, Fergus Leatherhead, departing their lands with giants at their backs, while before them lie in wait denizens of the bog-land and forest. Ever ready to protect and serve others, they gather in tow an assortment of displaced adventurers and find themselves embroiled in a mysterious search for the foundlings: orphaned Thiery with his companion Horatio the white wolf, and Suzie who has been deceitfully retained by the thieves Elvodug and Flemup. Others also seek the foundlings, and their purposes are most sinister - Dragon Priests who practice cozen sacrifices, and their leader Count Rosencross who is torn by his God given conscience and his pursuit of personal glory. Onward toward the city of Hradcanny they travel, meeting with treachery, beast attacks, camaraderie and psalms of praise with an eye toward the gospel. Though their battles are at times fierce and the outcomes uncertain, the author maintains the integrity of these noble characters, who through weakness are made strong by Him in whom they trust. 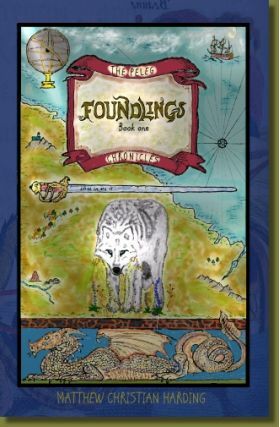 Foundlings weaves together the Biblical principles of chivalry, truth, courage, duty, faith and love within the framework of Genesis, and a bold adherence to its historicity. It's an exciting page turner that leaves you wanting more, but more importantly it leaves the reader with Godly heroes to think on and emulate, and a young earth creationist view of history that conforms to the Word of God. No magic, no evolution, no humanism.